Not a national holiday but Bank Holidays in the UK don’t relate to national days. This may be the closest the UK has to a national remembrance day (outside of VE Day, Holocaust Remembrance Day, and Armistice Day, the latter 2 of which are in November). CBeebies Let’s Celebrate: St George’s Day 15 minute episode in series covering different celebrations (e.g. Eid, Easter etc.) experienced by British pre-school children; coverage of St George’s Day. Sub 500,000 audience. 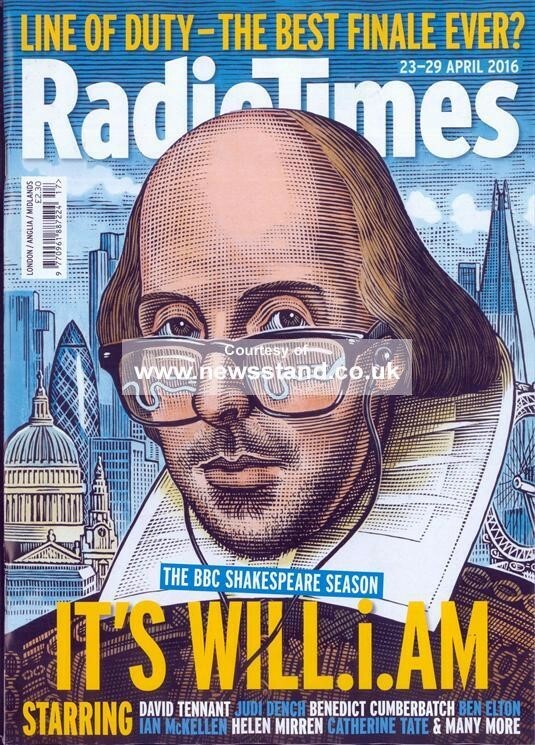 Front cover of Radio Times (listings magazine; covers all channels but originated with BBC in 1923 (http://www.bbc.co.uk/historyofthebbc/research/general/radio-times) ) 23-29 April: The BBC Shakespeare Season. Coverage of season covered entire week on the BBC including all BBC channels. BBC2 Shakespeare Live! From the RSC ‘celebration of the life, work and legacy’ of Shakespeare with jazz, hip hop, ballet and drama all inspired by Shakespeare and including a range of well-known actors. 1.54m audience, including repeats over the month. CBeebies 11am A Midsummer Night’s Dream – 55 minute version of the play designed for pre-school children. Repeated later in the same day and later in the week. Sub 500,000 audience. More4 (not BBC) Shakespeare’s Tomb 2 year investigation into Shakespeare’s grave – Dr Helen Castor as presenter-historian. Sub 278,000 audience. BBC4 Arena: All the world’s a stage – Shakespeare on Film 60 minute episode from documentary series; history of films based on Shakespeare plays. Narrator, footage, eyewitness testimony (footage). Sub 440,000 audience. EU Day/s – not a national holiday. See e.g. Mary Beard’s Ultimate Rome: Empire without limit BBC 2 27 April 2016 4 episodes 27/4 – 18/5: coverage in RT ‘Mary Beard asks what our politicians – from Westminster to Brussels – can learn from ancient Rome’ e.g. ‘Romans dispensed with border controls and used a single currency’. 8 May – VE Day / 15 August – VJ Day – not a national holiday. Summary – 46 hours of broadcast material which represents the past in some way (films, drama, documentary, game show. 46/c.840 broadcast hours = c.5.5% of the 5 channels’ output, or c.6.5 hours of broadcast material per day. Lebanon (2009) film, set 1982 during Israeli invasion of Lebanon. Great Canal Journeys series; celebrity presenter-led; travel through the UK’s canals, history from Roman times onwards. Penelope Keith’s Hidden Villages series; celebrity presenter-led, C19th and C20th cultural, agricultural and literary history. World War II in Colour 1943, America’s offensive against Japan. Footage-led, narrator. People v. OJ Simpson drama series; repeated on Sunday. Heir Hunters series about companies seeking to identify family members of people who died intestate; often includes aspects of mid-late C20th history (family history of the deceased). Who do you think you are? Celebrity genealogy series; narrator and different celebrity each week. Originally broadcast BBC1; repeated BBC2. Further Tales from Northumberland with Robson Green series, presenter led. Walking tour of Northumberland; reflections on celebrity’s childhood and lives of those living there past and present; archaeology and landscape. Masterpiece with Alan Titchmarsh celebrity-led (TV presenter/gardener) gameshow, visiting various historic houses in the UK. Competitors are history/antiques hobbyists. Win by working out the most valuable items on display. Back in time for the weekend series in which ordinary family live as if in an earlier decade (1950s-90s; then ‘future technology’ in final episode) over one weekend; narrator and commentary to camera by family. Technological/cultural history. Born to be different series following group of disabled children, all born in 2000: part of longer documentary strand charting their lives at e.g. age 4 (2004). Personal histories; changing attitudes to disability; medical history; social history. The best of bad TV series, comedy history of TV shows and problems in broadcasting. Narrator; footage. Portillo’s State Secrets – series (repeat); former MP Michael Portillo investigates Hitler’s hidden medical files. Celebrity presenter led; footage. Dunblane: our story account of the 1996 shootings at a primary school in Scotland, 20 years earlier. Interviews with family members; narration; footage. The secret history of my family series – genealogy; narrator; traces the ancestors of C19th UK criminals and comments on social mobility (or its lack) in contemporary UK and overseas. The Moors Murders: Britain’s worst crimes – account of murders in the 1960s and the following investigation and trial of the perpetrators. Narrator, footage, reconstructions and interviews. The Doctor Blake Mysteries – Australian drama series set in 1950s small town Australia. Best walks with a view with Julia Bradbury – series, celebrity (newsreader) touring British Isles; references to history and archaeology of areas visited. Some footage and interviews. Mr Selfridge drama about the life (early to mid-C20th) of the founder of Selfridge’s department store in London. Summary – 6 ‘specialist’ (not mainstream, former terrestrial) channels, all broadcasting all or a great deal of history programming (but NB current outlay of the History channel). All broadcast programmes are listed, not only the history-related material, to give a sense of how even apparently dedicated channels are quite flexible in their interpretation of the past and their sense of what will appeal to their audiences. History material = c. 110/130 hours of programming on e.g. March 5 = c.84.6% (including e.g. American Pickers and other series based around antiques; removing such programmes would alter the %, to c. 825/995 hours of history programming March 5-11 = c.82.9%). 825 over 7 days = c.118 hours of broadcast material per day over 6 channels, or c.20 hours per channel per day. Annihilation: double bill – series, how was the Shoah possible? Footage, talking heads; narrator. Multi-co-pro. David Cesarani as historical adviser. William Karel (French film director). Battlefield – orig. BBC; aired 1995-. WW2 documentary series; narrator; footage. Tanks – footage; narrator – history of tanks WW1-present. Impact of individual tanks in their own ‘lifetime’; comparison top 10 tanks. American Experience: Geronimo and the Apache resistance – series, ‘TV’s most watched history series’ (according to PBS website). C19th US history. Narrator, photographs, descendants’ testimony. American Experience: Last stand at Little Big Horn – as above; C19th US history. Narrator, photographs, footage, testimony. American Experience: Jesse James – as above; reconstruction, narrator, photographs, testimony. American Experience: Custer’s Last Stand – as above; reconstruction, photographs, narrator, testimony. Ganges: triple bill – orig. BBC; geography/anthropology/history of river; co-pro BBC/France 3. Narrator. Great British Railway Journeys (2 episodes) – orig. BBC series, presenter-led (Michael Portillo) travelling around UK using Bradshaw’s railway guide from 1860s to ‘understand Britain of today’ – change over time etc. British mid-C19th social, economic and technological history to present. Interviews, photographs. Bombay Railway – orig. BBC4 series, narrator and interviews; significance of railway to India; some e.g. history of Empire but mainly C20th/C21st. Great British Railway Journeys (2 episodes) – see above. She-wolves: England’s early queens – orig. BBC series, presenter-led (Helen Castor, medievalist, formerly of Cambridge University), footage, UK royal history medieval – present. Find my past – series, presenter-led (BBC sports journalist Chris Hollins), ordinary people discovery ancestors’ roles in great events. C17th (e.g. Gunpowder Plot 1605) to C20th. Footage, testimony and photographs. Harlots, housewives and heroines: a 17th century history for girls – series, orig. BBC4. Presenter-led by Lucy Worsley. Reenactment (e.g. clothing); reconstruction; interviews with historians. Ax men – series, timber workers in the present. American restoration- series, restoration companies in the USA and their work. Ancient Aliens – series, influence of aliens in ancient cultures. Narrator, expert testimony. Egypt – present. Billion dollar wreck – 1909 shipwreck of the Republic; attempts to raise it; personal history of key personnel involved; photographs, testimony of descendants, those engaged in raising it, experts; reconstruction. Storyville: Himmler, the decent one documentary series (Storyville) – account of life of Himmler told through artefacts e.g. letters, photos and diaries found at his home. Horatio’s drive – Ken Burns’ series; 1903 car journey across US; first of its kind. Narrator, footage, photographs, expert testimony. Brooklyn Bridge – ‘Ken Burns America’ season; 1981 film (KB’s first); testimony, footage, narrator. C19-C20 US history; social, economic, technological. The statue of liberty – ‘Ken Burns America’ season; testimony, footage, narrator. C19-C20 US history; social, economic, technological. B-2: Stealth at war – plane developments 1970s – present. Technological and military history. Narration; expert testimony; footage. The sixties: the years that shaped a generation – 2005 series; photographs, footage, eyewitness testimony, narrator. Social, political, cultural history. Cash in the Attic – ‘turns hidden treasures into cash’ –antiques in people’s houses are valued and sold at auction. Britain’s stone-age tsunami: Time Team special – see above re. Time Team; Stone Age natural disaster. Hidden killers of the Victorian home – series, ‘Hidden Killers’, orig. BBC4 2013. Tudor to Edwardian. Presenter-led (presenter/historian Susannah Lipscomb). Expert testimony, re-enactment (corset wearing). Coast – orig. BBC series co-funded by Open University; history, geography and archaeology of British Isles, later Northern Europe and Australia from Stone Age – present. Presenter-led (archaeologist Neil Oliver); footage, photographs, testimony. Monarchy by David Starkey – series, orig. Channel 4, British monarchy medieval – present. Presenter-led, footage, photographs, expert testimony. The Two Ronnies Spectacle – series, orig. Gold 2013; documentary about comedy duo Ronnie Barker and Ronnie Corbett, footage and testimony. Blackadder II – comedy history series c.1982-1989; series 2/4 set in Elizabethan court. Celebrity Antiques Road Trip – orig. BBC; celebrities travelling around the UK, to antiques shops, to buy and sell at a profit for charity. The Re-inventors – Canadian TV show 2008-11; making and testing historical inventions – experimental archaeology of sorts. C16th to C20th, technological, cultural, social history. Shipping Wars – orig. A&E 2012-present, reality series about competitive shipping of goods across the USA. Showdown: air combat – mini-series 2008; comparing C20th aircraft. Technological and military history. Top tens – orig. Military Channel; rates 10 weapons e.g. rifles. Technological and military history. Greatest tank battles – series, orig. National Geographic 2010-present; CGI, eyewitnesses; expert testimony; footage. Technological and military history. Ultimate weapons – series; comparison of contemporary weapons. Greatest tank battles – see above. Ultimate weapons– series; comparison of contemporary weapons. Hitler: a profile – orig. ZDF 1995; reversioned series; pre- and WW2 history, footage, photographs, narrator, eyewitness testimony. The Civil War – series, ‘highest rating PBS series ever’; expert testimony; photographs; narrator. C19th US military and political history. The road from Christ to Constantine – series, 2016, 4 centuries to C5th CE. Presenter-led (Jonathan Phillips, historian). Religious and cultural history. B29: frozen in time – 1996; the restoration of a B29 plane stranded in Greenland since 1947. Narrator, eyewitness testimony; footage. Journeys to the bottom of the sea: D-Day the untold story – orig. BBC2 2000, underwater archaeology, why thousands of Allied troops did not arrive on the beach and died previous to the landing. Narrator, reconstruction, eyewitness testimony. Oz and Hugh drink to Christmas – orig. BBC2 series c.2010, creating alcohol past and present; celebrity presenters Oz Clarke (wine aficionado) and Hugh Dennis (actor/comedian). The secret of Lincoln jail: Time Team special – as above re. Time Team; medieval – C19th penal history. Impossible engineering – series, technological pioneering developments in present, developed from the past. C20th history. Yes Minister – orig. BBC; political comedy 1970s-80s. Steptoe and Son – orig. BBC; comedy 1960s-70s. The man who discovered Egypt – see above. Texas Rising (repeated in the same day) – drama series, Texas Revolution against Mexico, C19th US history. The Taff: the river that made Wales series. Presenter Will Millard. First shown BBC1 Wales. Interviews, footage. The Brecon Beacons with Iolo Williams series. Presenter-led, geographic and historic interest in area. First shown BBC1 Wales. Indian Hill Railways series. Culture and history of India, C19th and C20th. The story of British Pathe series. Narrator, footage. World War II: for king and country – 6 part series, historian presenter-led (Norm Christie); footage; WW2; Canada’s role: little known histories. Killing Hitler – series. Drama-doc, Operation Foxley. Footage. Narrator. Eyewitness testimony. Agnetha: Abba and after – orig. Channel 4 documentary; eyewitnesses/commentators; footage about Abba and later years. The Somme’s secret weapon (Time Team special) – see above re. Time Team; WWI military history. The lost submarine of WWII (Time Team special) – see above re. Time Team; WW2 military history. Ancient black ops- series, ancient world, military history, Spartans etc. Reconstruction; expert testimony. Castle Builders – series, European castle building. Architecture. Mummies Alive – series, narrator, expert testimony; ‘best preserved mummies’ ‘brought back to life’. Ancient period. Open all hours – Comedy series, originally made 1970s. Treasures Decoded the secrets of El Dorado – Series, archaeology/history; expert testimony; ‘5 of the world’s greatest treasures’ with secrets not previously revealed. Ultimate Warfare Fallujah in 2004 – orig. Military History series; modern battles and eyewitness testimony; narrator. Ancient Egypt: life and death in the Valley of the Kings series (repeat from previous Thursday) – 2 part series, presenter historian (Joann Fletcher). Dreaming the impossible: unbuilt Britain series. Series orig. 2013; presenter-historian Olivia Horsfall-Turner; expert testimony. Stories behind the grandest designs never built. Timeshift: crime and punishment – the story of corporal punishment – orig. 2011; archive footage, narrator, history documentary series; expert testimony (inc. pro and con corporal punishment). Legacy of War – series orig. 2015, presenter –led (Walter Cronkite and Alastair Stewart); expert testimony; footage: creation of the UN, World Bank and Marshall Plan; seems a UK/US co-production, accounts from both nations. Air Warriors – series, orig. Smithsonian Channel 2015; USAF’s most successful planes; narrator, footage, photographs; eyewitness testimony. Town with Nicholas Crane – series orig. BBC2 2011-13; urban history; presenter-led by geographer NC; co-produced by Open University; was shown on the Blighty Channel 2012. Ghost Army – orig. PBS; WW2 camouflage; narrator and footage. Alexander’s lost world – series; orig. 2013; CGI; presenter-led (David Adams) travelling through modern Afghanistan and Asia in footsteps on Alexander; testimony of local people (oral history). Martin Luther King: Roads to Memphis – orig. PBS America? Footage, eyewitness testimony; photographs; expert testimony. Nation on film: the Munich air disaster – orig. BBC4 2008; narrator, footage, eyewitness testimony, crash of plane carrying Manchester United footballers, 1958. Who’s in your history? – series, short (25 min.) episodes, genealogy, footage, narrator. Britain’s biggest heists: the 1975 robbery of a bank in Mayfair, London – series, 1970s-C21st history of bank robberies; narrator, footage, expert testimony. Mobsters: the life of Sam de Stefano – series, narrator, footage, expert testimony, eyewitness testimony, photographs; US mafia 1920s-present. Kenny Rogers: cards on the table – orig. 2014, expert testimony, footage, interviews, life of Rogers. Bob Harris: My Nashville – orig. 2014, celebrity presenter-led (DJ Harris), interviews and footage, history of Nashville and country music. Country Kings at the BBC – orig. 2014, chronological collection of footage of country musicians’ performances 1950s-present, eyewitness/celebrity testimony, photographs, narrator. Air heroes: as close as brothers – orig. History Channel 2010; Canadian-made; reconstruction, narrator, eyewitness testimony; Canadian crew of a Lancaster bomber brought down in 1944. People v OJ 5th most popular BBC2; c.2.5m. See above for details; drama based on historical events. Grantchester 13th 5.4m. See above for details; crime drama set in 1950s. Best walks 19th 3.2m See above for details; history/geography/general interest. Raised by wolves 17th 1.2m. See above for details; 1990s West Midlands, working-class family. Average of both sets of channels (mainstream and specialist) = 11 channels. c.46/840 + 825/995 = 871/1835 = 47.5% of broadcast material on the 11 channels relates to history; 871 hours / 7 days = c.124 hours of broadcast material per day; or c.11 hours per channel per day. Main news broadcast on National Remembrance Day (if VE Day then 8 May). Not much – BBC 10pm news included coverage of VE Day in Russia e.g. http://www.bbc.co.uk/news/36245409 and how it serves to show Russia’s C21st military strength; greater interest in significance of local, and mayor of London, elections. Lack of coverage was probably also because so much on TV last year to mark 70th anniversary. Surprisingly little on local news e.g. Lincolnshire BBC – main story, sperm whale washed up on Lincolnshire beach. BBC 5.30pm (weekend) news not available online. NB BBC on Youtube This Week In History www.youtube.com/watch?v=XaRyKaiQzO8&list=PLS3XGZxi7cBXmZSG3_cOGqURFPXa1L9Vz only runs to 1 May (from November). Main news broadcast on Europe Day (9 May) – check Radio Times. As for ITV news (below). Discussion of proposed Brexit. 44 days until referendum. See also e.g. BBC Radio 4 1st May Open Country (series) – ‘Dawn chorus across Europe’ (East to West, Russia to Ireland). BBC News channel: coverage of European Parliament 9 May including Martin Schulz’ speech to mark Europe Day. 1950s – post-war; ongoing poverty (e.g. Call the Midwife). Which approach to the past: documentaries? Testimonies? Anecdotes and mysteries? Romanticized history? Biographies? Documentaries including eyewitness and expert testimony, footage and narrator are the most common form of representation, even when including dramas set in the past, and this type of documentary appears across almost all channels analysed. Some ‘history mystery’ type programming: tend to be more on the Discovery Channel although Secret History of my Family was on BBC2 – not very successful so may reflect a lack of interest in secret/mystery history programming on the BBC (more likely on Channels 4 or 5 and other, smaller channels). A few biographies but not many: Shakespeare was a themed season but little biographical material; Call the Midwife is autobiographical; Johnny Cash documentary. Which causes or motives are taken into account to explain historical evolutions: human decisions, chance, structural constraints such as economy, collective actions, love? The accounts are most likely to be narrative rather than offering analysis.